Protect your small business while also connecting yourself at all times. 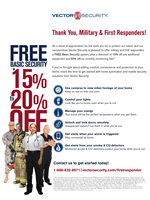 All Military (Veteran & Active) and First Responders are eligible to received a Free Basic System with a 20% Discount on the Monthy Rate and 15% Discount on additional equipment outside of the Basic Package, such as Cameras, Smart Door Locks, or Smart Thermostats. Vector Security and The Philadelphia Contributionship are working together to provide our customers with exclusive discounted rate. 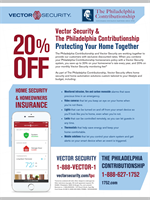 When you combine your Philadelphia Contributionship homeowners policy with a Vector Security system, you save up to 20% on your homeowner’s rate every year and 20% on your monthly Vector Security fee.